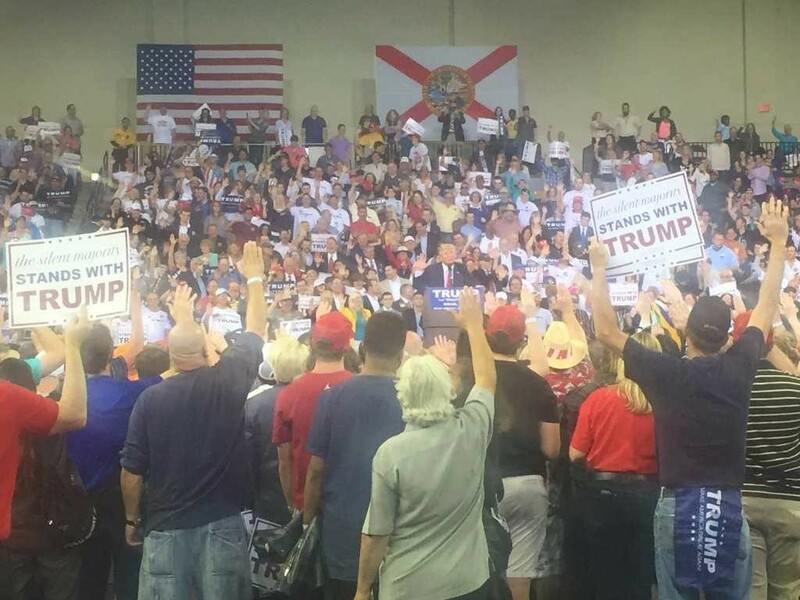 ORLANDO, Fla. — A crowd gathered to rally in support of Republican presidential candidate Donald Trump raised their right hands and engaged in a swearing with Trump without foreknowing what they were about to pledge. As hands went up across the room, he led the crowd in the pledge piece-by-piece. “[W]ill vote on or before the 12th for Donald J. Trump for president,” Trump then had those gathered repeat. The crowd then broke into cheers, waving their “The Silent Majority Stands With Trump” signs. “Don’t forget you all raised your hands. You swore. Bad things happen if you don’t live up to what you just did,” Trump threatened. Just prior to the pledge, Trump spoke about his plans regarding the torture of captured terrorists, seeking middle ground after he told reporters Friday that if elected president, he would not order the military to violate U.S. or international laws. He had stated just recently that he believed the country should “go a lot further” than waterboarding suspected terrorists, prompting CIA Director Michael Hayden to state that the U.S. military would not follow any illegal orders issued by Trump. Florida’s Republican primary is set for March 15, and both Donald Trump and Ted Cruz are seeking to seize the win from Florida Sen. Marco Rubio.